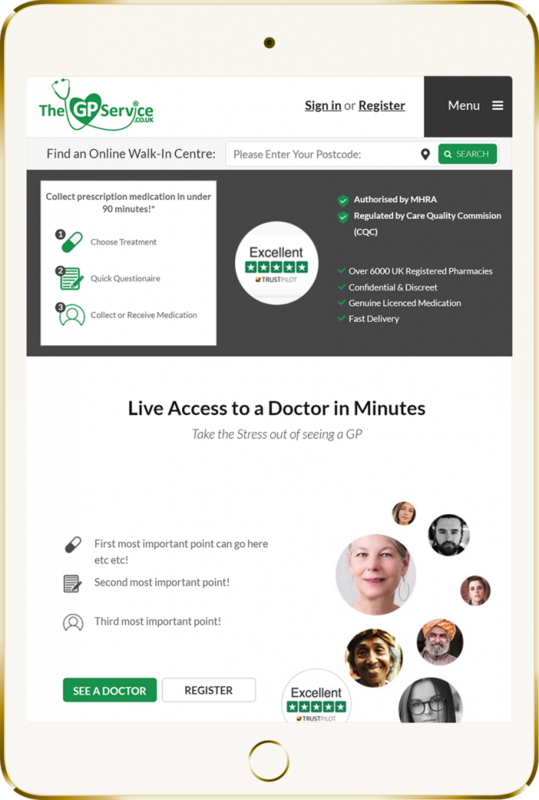 With Doctors surgery waiting times escalating, more and more people are turning to online services for private medical advice and prescriptions. The GP Service is a leading solution for online and in-pharmacy doctor’s consultancy services. Our simple to administer systems, enable the public to talk to doctors and receive medical advice, and manage the related actions for referrals and prescriptions in a safe, secure and MHRA-authorised environment. We would like to offer you the opportunity of joining our growing network of pharmacies as either a Gold or Silver member. As a silver member, you will be able to offer private prescription fulfilment to our online users through our secure dashboard. As a gold member, you can offer actual doctors’ services from within your pharmacy, enabling you to convert potential private sales requiring a Doctor’s prescription in minutes, while providing a unique and valuable service for the community. Please register your interest below and a member of our support team will be in touch. Patient completes an online assessment or attends an online doctor’s appointment at their convenience. Prescription payment is processed online or in-store by the nominated pharmacy. An authorised prescription is generated and transferred to the patients’ nominated pharmacy. Treatments are collected or delivered by the pharmacy. No contracts, sign up or membership fees!